It all began with the strike of a match in the midst of total darkness. People were waiting anxiously and the excitement was building for that one moment…that moment of “ahhhhhhhhh” when one could breathe out the stress of the past and open to the sheer wonder of the present…the freeing that comes with a new year. 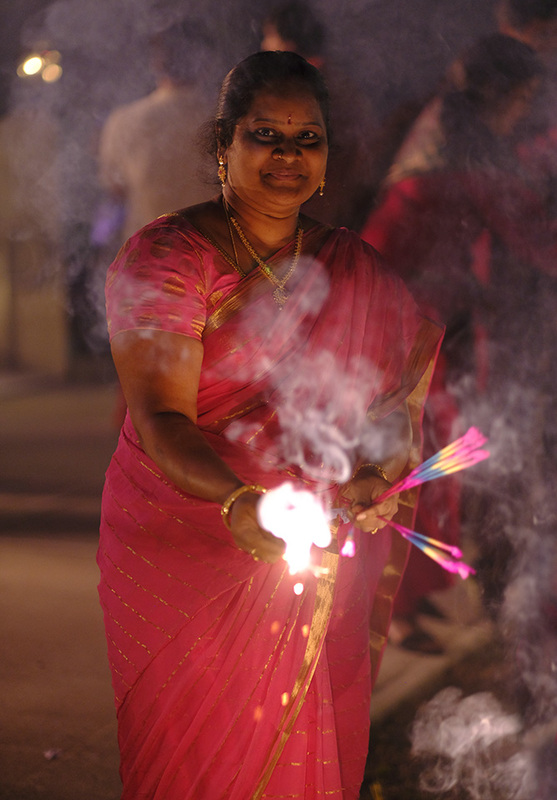 I was thrilled to be asked to photograph Diwali, the Hindu festival of Lights this past Thursday night. It is celebrated every year here in the northern hemisphere between late October and early November, depending upon when the 15th day of the Hindu month, Kartik falls. The festivities go on for typically 4 or 5 days with each day rooted in its own legends and myths and serving to illuminate one’s spirit with the brilliance of joy. At the center of each legend is the victory of good over evil, wisdom over ignorance, light over darkness and hope over despair. Aartis or devotional hymns are sung eulogizing Goddess Lakshmi with sweets and fruits offered to her. Homes and businesses are illuminated and new clothes are worn as a sign of respect and thanks to the heavens for the attainment of health, wealth, knowledge, peace and prosperity. 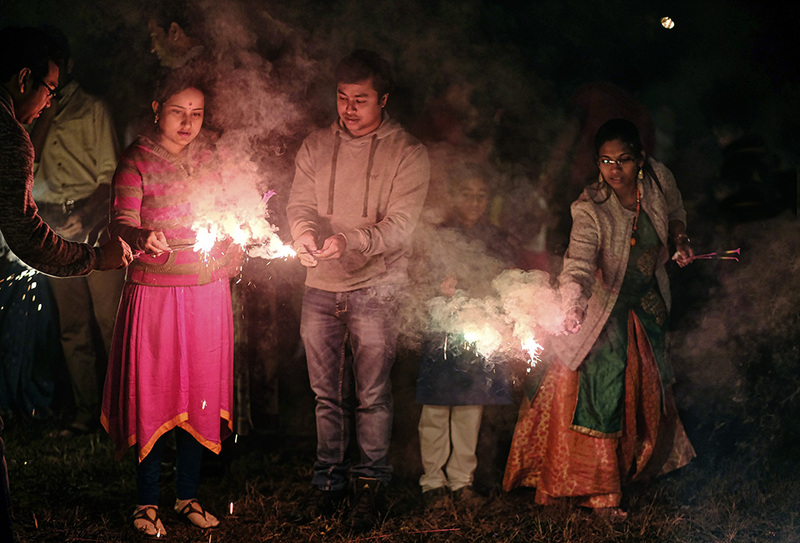 Families, young and old all gathered around outside the Bharatiya Temple At 7:30, the night sky was totally lit up with brilliant colors surging high into the air, released from their pent up containers. 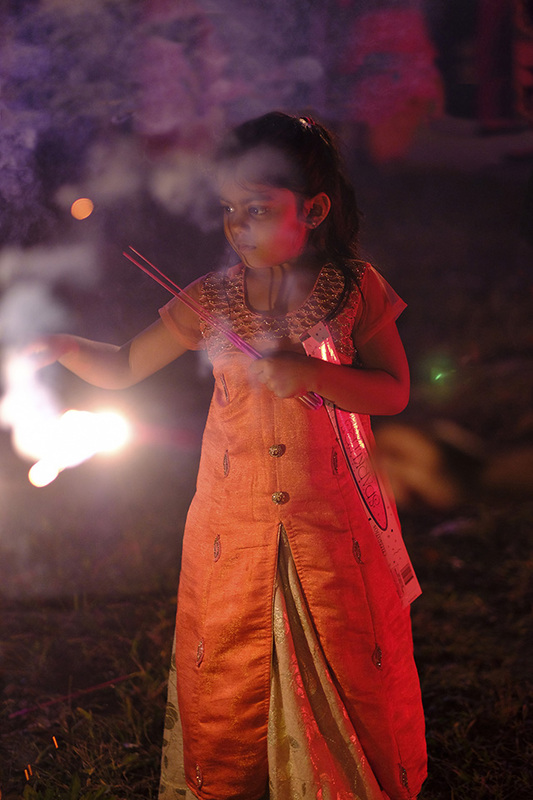 Fireworks ignite that spirit of wonder no matter how many times we see them! 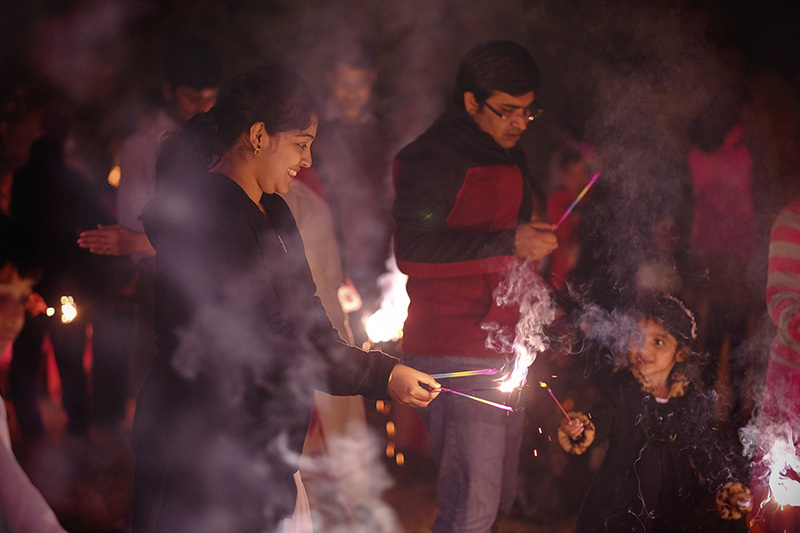 According to one belief, the loud explosive sound is the way to let the gods know of the people’s thanks and joy from the earth. 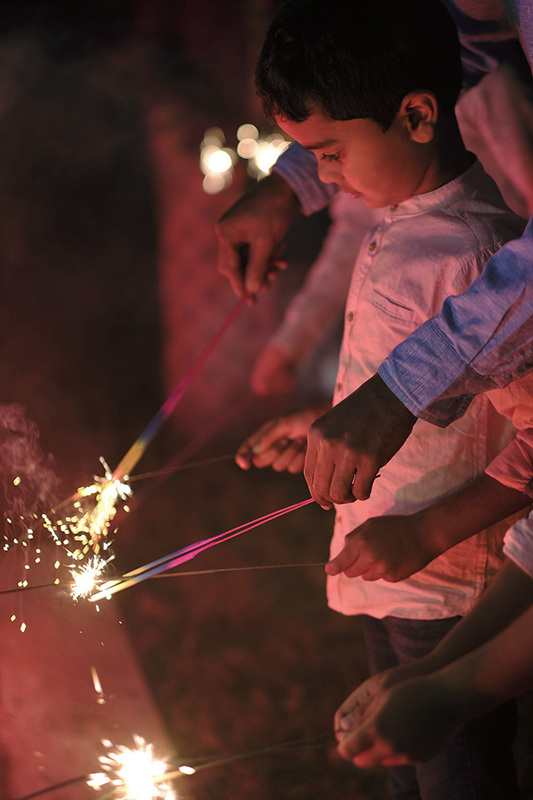 While the fireworks were going off overhead, people were passing around sparklers, sharing that dancing, popping light from family to family. It was all such a spirited celebration. Everyone was smiling, hugging and sending along well wishes. 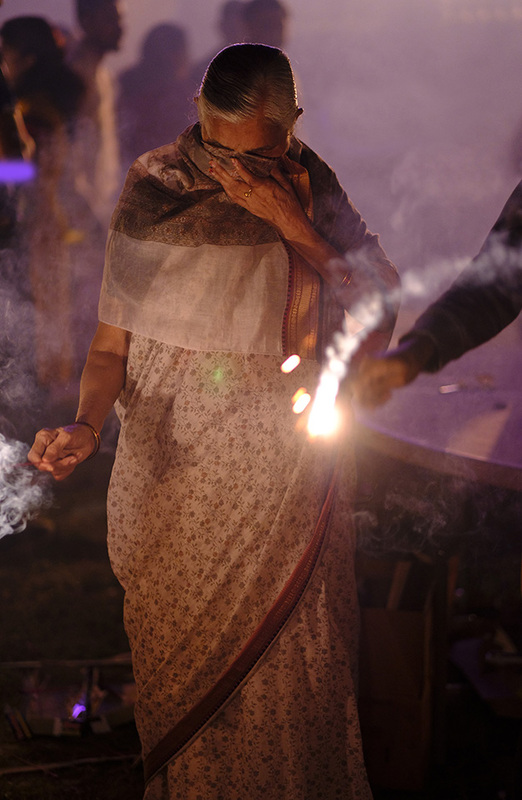 This was the first time I had the privilege of attending a Diwali festival and the brilliant joy that each spark gave off was totally enveloping. I loved photographing on this night, even though the exposure and color were challenging, it led to interesting blur, lighting so blown out and brilliant that I just went with it to capture the mood and the essence. 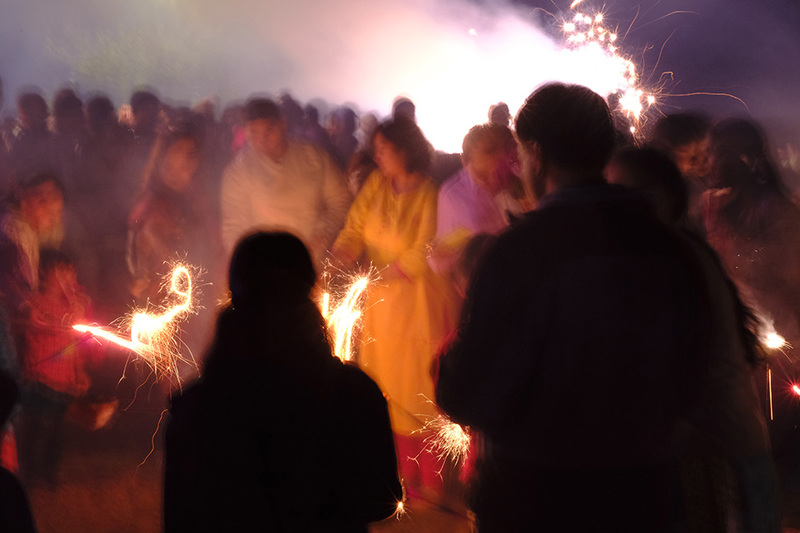 As Joseph Campbell said,”…then comes the new life and all that is needed.” It is believed that, “Diwali is an opportunity to cultivate and connect with eternal bliss.” On Thursday night, I did!